SEAT is an installation by NYC-based E/B Office (previously here). 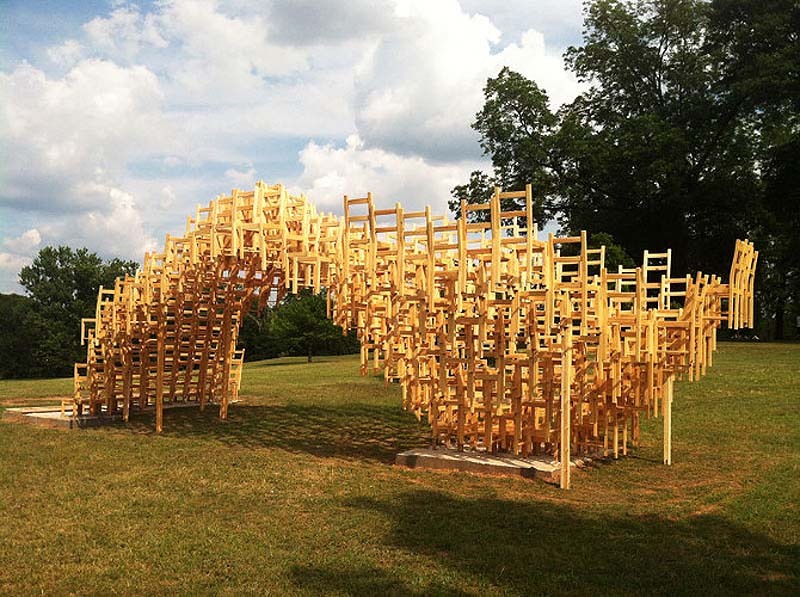 Composed of approximately 300 simple wooden chairs arrayed and stacked in a sine wave surface drawn into an agitated vortex rising from the ground, chairs are transformed from detached useable objects into structural and spatial components of an ambiguously occupiable edifice. 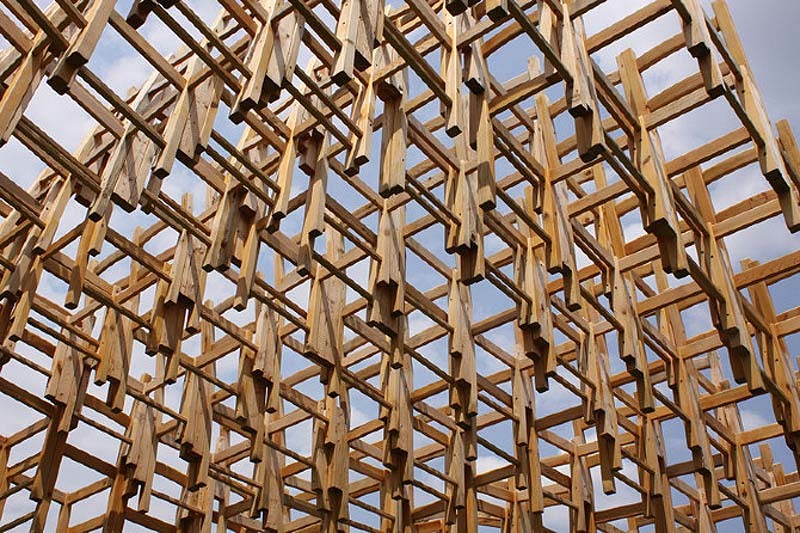 It’s intended to be legible as a collection of individual seats, but when approached, visitors realize that sitting down in any one of them amounts to a deliberate act of occupation; a temporary social contract to redefine their perception of sitting embodied as architecture. Chairs around the immediate periphery are rotated for outward observation of the city and the surrounding neighborhood. At the base of the vortex, chairs turn inward to create an intimate, compressive space for visitors to converse and regard the upward flow of chairs transcending their function. Chairs suspended above ground between these zones re-constitute the role of the seated object as one that can also play as structure, decoration, and enclosure. The chairs are additively assembled through a modified “corbelling” process achieved by sequentially attaching chairs beginning at the edges and corners working towards the center. The chairs are resiliently connected to each other via simple lag bolts, clamps, and screws that are hidden from view. Nice! This is really innovative 🙂 Thank you for sharing this!